The Plank. It’s become a staple of workouts everywhere and promises to be the ultimate core workout that can be done anywhere as it requires no weights or equipment. As an isometric exercise (meaning that it is performed in a static position), the main goal when performing a plank is to find your perfect form and hold it solidly for as long as you can. When it comes to the standard plank, you use your hands and toes to hold your body in a static position. You will feel your abs, shoulders, triceps, quads and several more muscles engaged while trying to maintain your position. Some variations on the standard plank include using your forearms flat on the ground as opposed to your hands. There are also weighted versions, side planks and any number of other variations. A basic, proper plank means that your head, neck, entire back along with your hips and heels are all, essentially in line. A good way to achieve this is to look straight ahead at the floor and imagining tucking your chin into your chest and pulling your belly button up into your spine. However, if you aren’t doing it properly it isn’t going to give you the results that you are looking for. So with that in mind, let’s take a look at some of the more popular mistakes people make while doing a plank and how we can fix them. This is a big one, as committing this simple error can throw your entire plank out of whack. If you allow your bum to dip, it will compromise your lower back. To fix this, you need to engage your core. That’s a phrase that you hear a lot when it comes to your plank, but what does it actually mean? Here’s where you need to focus on pulling your belly button up towards your spine. The plank is one position and downward dog is a different one. In downward dog, you are in more of an arched position with your bum up in the air. If that’s what your plank looks like, you are doing it wrong. You need to keep your back flat so that your abs are working to help you keep the position, which is the point after all. Remember that your spine goes from your back into your neck and head. For that reason, keeping your head and neck up and in line with the rest of the spine is an important part of your plank. The best way to do this is to focus on the floor about a foot in front of where your hands are. This should keep your neck in the proper position. Trying to hold a strenuous position on it’s own carries with it a natural reaction of holding your breathe, as does the act of pulling your belly button in. Don’t! Like all exercising, breathing is an important part. Holding your breathe adds to the stress level of holding your plank and actually makes it harder to hold your position. Approaching your plank from a yoga like frame of mind- it can be easier to maintain your form if you put more of your focus onto your breathing. The world record for holding an un-weighted plank is just north of 3 and half hours. You aren’t going to beat that as part of your average workout, so instead of keeping your focus on how long you are managing to hold your plank for, focus on keeping your plank form proper and hold it until you can’t keep your form anymore. The more you work on your plank, the longer you are going to be able to hold it for, but time is less important than form. Staying conscious of flexing your core muscles is important. 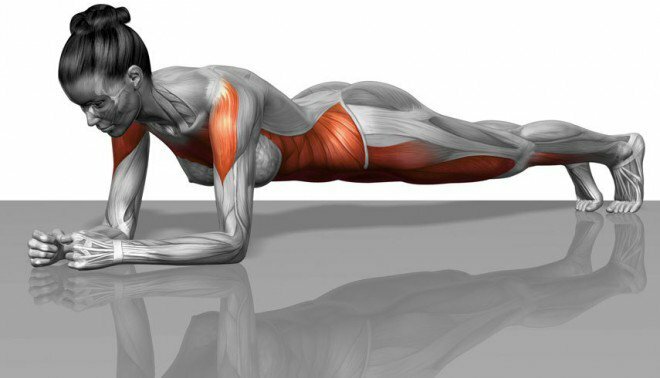 It is possible to hold yourself in a plank position without actively flexing your core muscles. A good way to tell if you have properly engaged your core is to take note of how soon you “feel” the plank. If it takes a while, you aren’t properly engaged, as most experts agree, you should feel it in your core almost immediately. Similar to the position you keep your head in, allowing your shoulder to move into a more rounded position shifts the weight from your abs and your core, which is where you want it, to your arms, traps and neck. Try and squeeze your shoulder blades and attempt to keep your chest tall. If you can avoid those common mistakes and downfalls you will be able to rock your plank, tighten your core, and add an awesome exercise to your repertoire.